Global Clinical Trial Imaging Market : Global Industry Analysis and Forecast (2018-2026) _ by Product & Services, Imaging Modality, End User, and Geography. Home » Reports » Healthcare » Global Clinical Trial Imaging Market : Global Industry Analysis and Forecast (2018-2026) _ by Product & Services, Imaging Modality, End User, and Geography. 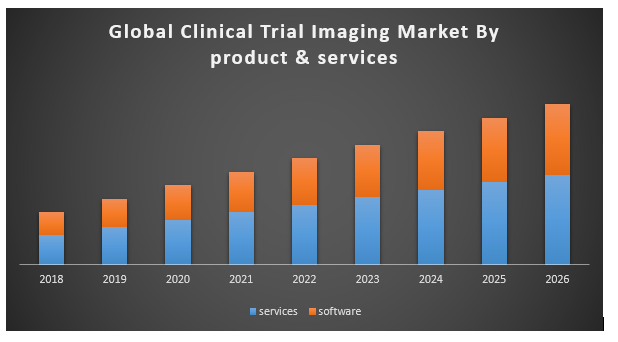 Global Clinical Trial Imaging Market is expected to reach USD1476.12 Million by 2026 from USD879.95 Million in 2018 at CAGR of 6.68% during forecast period. Key factors powering market growth are the raising number of contract research organizations, development in the pharmaceutical & biotechnology industries, and growing in R&D expenditure are the important drivers for the growth of the clinical trial imaging market. However, the high implementation cost of imaging systems is limiting the growth of clinical trial imaging market. Global clinical trial imaging market is segmented by product & services, imaging modality, end user, and geography. Imaging Modality is segmented by magnetic resonance imaging, computed tomography, positron emission tomography, ultrasound, and others. Computed Tomography segment is expected to register the highest growth in the forecast period. High advantages of CT in screenings for cancer (tumors), injuries, and abnormalities inside the body are expected to drive computed tomography market growth. Based on Product & Services Market is segmented into software & services. Services sub-segment is estimated to hold the largest market share in the forecast period. The high cost of the imaging equipment, which is leading to increased outsourcing of imaging clinical trial by pharmaceutical, biotechnology, and medical device manufacturers to service providers will result into the increasing share of services segment market. APAC is going to emerge as one of the higher growth regions during forecast period followed by North America and Europe owing to increasing development in pharmaceutical & biotechnology industries and raising R&D spending in the region will fuel the global clinical trial imaging market in APAC region. 13.7.5 Rest of Asia Pacific. 14.10.3 Rest of Middle East & Africa. 15.6.1.3 Rest of Latin America.